I am a tad emotionally conflicted on this one, but it's too big not to post. 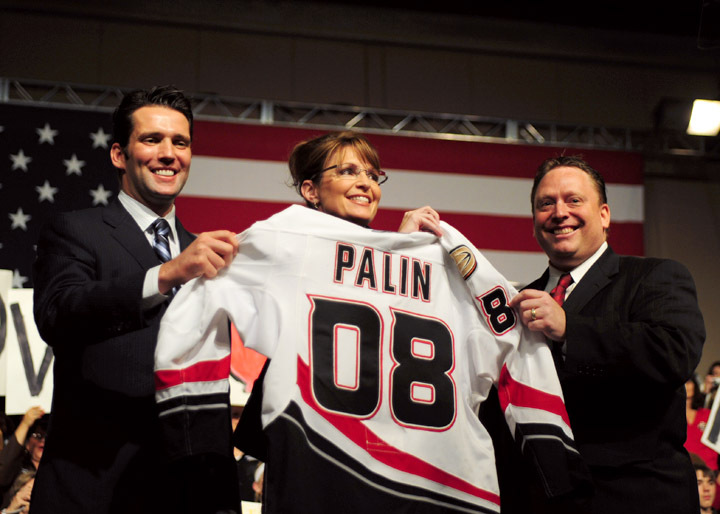 Sarah Palin, Vice Presidential Candidate and Queen of Hockey Moms, was presented with an Iowa Chops Jersey on Saturday at a campaign rally in Des Moines. It's not every day that you get to see one of the country's most loved and hated individuals showing off one your creations; which, you could say, similarly polarized hockey fans. With too many easy Lipstick on a Pig jokes to be had, I really hope this makes it on the Daily Show. This item did make the LA Times who said "The jerseys actually are cool, thanks to the logo of a rather angry pig on the front." Thank you to the LA Times for your fine taste in hockey gear.